Even though Christmas is just a few days away and most of you have all your holiday decorations up, there may be an area you have forgotten to decorate, or just passed over all together. Christmas decorating is generally reserved for the roof lines, trees, shrubs, and even lawn ornaments, but have you have considered adding a little extra something to your water feature this winter? Just because you shut down your water feature or pond for the winter, doesn’t mean you can’t include it for the festivities of the season. One fun and simple idea is to use blue mini LED lights to mimic the look of your stream. This would look really great in a pondless waterfall! 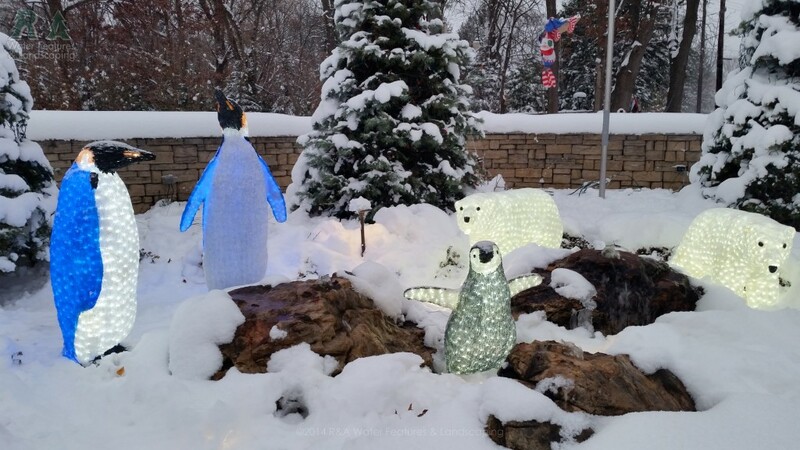 You can get really creative with the lighted figures on your lawn, now think about how much more creative you could get by placing lighted figures near by your pond or water feature. Below is from a property in Kalamazoo, Michigan that we currently decorate. The owners are wonderful people that really get into the Christmas spirit year after year. They have a bubbling rock water feature at the entrance of their driveway, add in the polar bears and the penguins and it may start to resemble the arctic…including the temperatures. 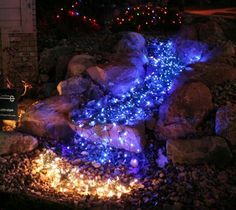 Even with the addition of the simple lighted deer figures around your water feature, skating children figures, or maybe some lighted birds you can turn your holiday decoration into something very unique. Also think about the shrubs or any smaller trees around your water feature, include these to really turn your pond into a fun Christmas pond. While this is from a botanical garden in the state of Washington, it still is an incredible look..for the holidays or even through winter. 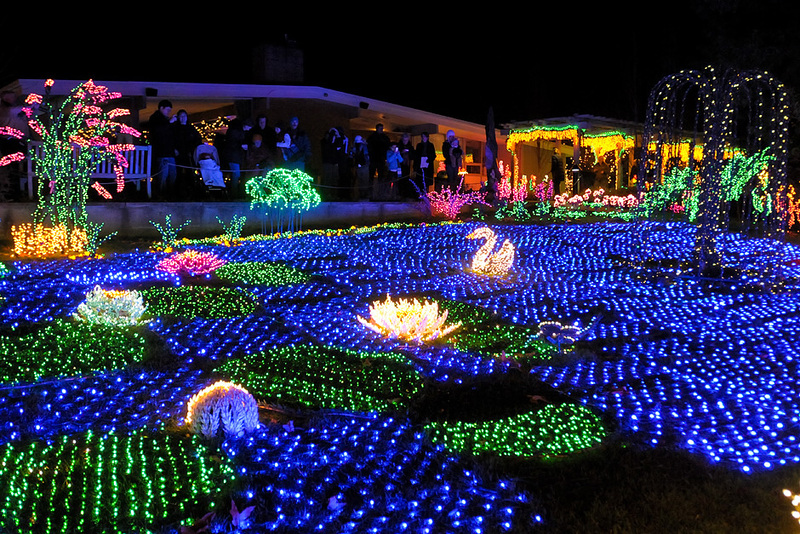 While we know most of you don’t want your lawn turned into a pond made of lights for the winter season, this can open up your imagination and get you to think about ways you can liven up your pond during the winter season…it never hurts to get creative!